Stuff like this 4WD off-road RC military truck is the virtual reality of my childhood. We didn't have VR glasses then, and video games didn't have quite the number of pixels they do now, so RC toys and 1:16 scale models were the closest my imagination could get to driving something real cool in real life. Except for that one night my friend Cornelius and I found a bulldozer left with the keys in it near a construction site and spent an hour driving around doing a little after-hours excavating. My point is, at one point in my life, a little off-road RC military truck was about as good as it got. And even today, it's not so bad. This model from Goolsky has a C-shaped metal suspension beam strong enough to support the 6-pack you might have your truck haul, plus super bright LED headlights to make sure you don't crash it and get the cans all shook up during transport. 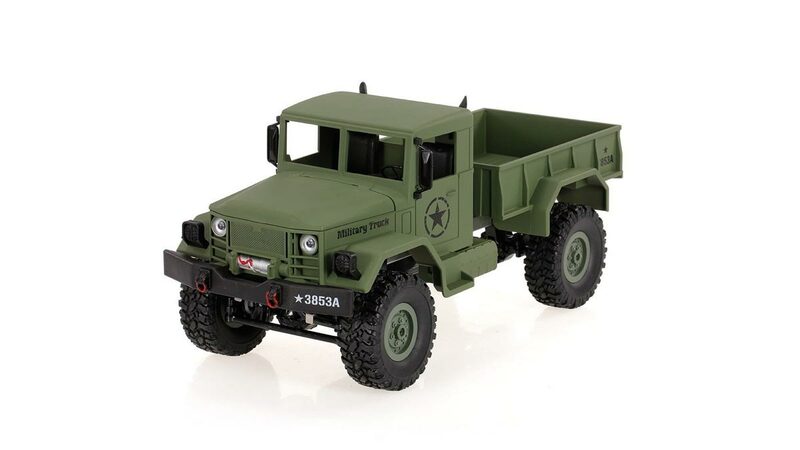 The RC military truck has a rechargeable 700mAh NiCd battery that runs around 20 minutes per charge.